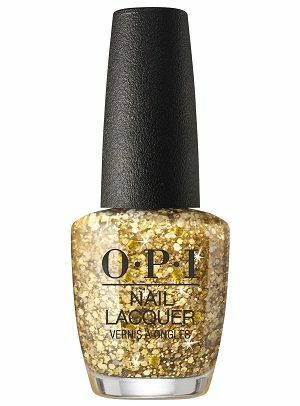 OPI Nail Polish, Gold Key To The Kingdom, HRK13, .50 fl. oz. Glitter topper with multi-shaped and multi-sized metallic gold glitter, white matte hex glitter, and scattered gold micro-glitter in a clear base.